Sometimes something happens and Windows starts displaying wrong icons on the desktop. For example, you might have upgraded an application and the new version came with a new and improved application icon, but you still see the old icon on the Desktop. Or, a blank or damaged icon image appears where a perfectly good icon was displayed before. Does this sound familiar? The most common reason for the problem with the icons is the corruption of the Windows icon cache. If you don't know what icon cache is, it's a special file that Windows uses to keep copies of each icon handy. When Windows needs to draw an icon, it uses the copy from the cache rather than retrieving the icon image from the original application file. It makes Windows draw the icons much faster. So, what to do if the icon cache file became corrupted or damaged, or if Windows did not replace a copy of an icon in the icon cache with a new image of the icon for some reason? The solution is simple: you need to force Windows to rebuild its icon cache! The easiest ways of doing that is by deleting the IconCache.db file. If that file is missing, Windows will build it from scratch. However, deleting this file is tricky: it turns out that Windows keeps a copy of this file in the RAM memory, and if you delete it, with will create a new copy of this file from it's RAM copy, without refreshing the icon images! If you don't like Windows displaying the hidden files and folder, you can change this option back after completing the steps below. (If you have just enabled the Show hidden files option, you may need to press F5 in AB Commander to refresh is window and make the hidden files and folders to appear in the file listings.) Delete the IconCache.db file, and keep AB Commander window open, do not close or minimize it, you will need it a bit later. The icons on your desktop will disappear, but don't panic, they will be back in a minute! 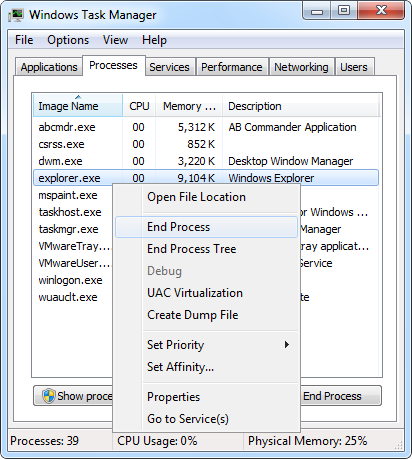 (You could also start Explorer using the File - New Task (Run) command of Windows Task Manager.) Your desktop icons should be back. The above procedure should force Windows to recreate its icon cache file from scratch. If you don't see the IconCache.db file right away, don't worry, it will appear after you log off and log back on to (or restart) Windows. Thanks so much! It worked for me! (Win 7 64-bit) It’s been driving me crazy and none of the Microsoft tech guys in the forums seem to have the answer. I have followed your instructions and can not find the IconCache.db file at all. So I carried out the instructions and stopped explorer via task manager and restarted via AB….no difference. I am using Vista Business. Max: You need to replace User with your actual user name, that is set up for you in Windows. Good luck! thanx for the article. I have a 2gb thumb drive that i formated but since then i cant see it in my computer when i plug it. I have tried it in windows xp and linuxmint12 but to no avail. Have i lost my drive or what? P.s. You can email me your answer directly, thanx. He is not a fool. He did not find THE FILE, not THE FOLDER. I have the same problem – no file at that location. 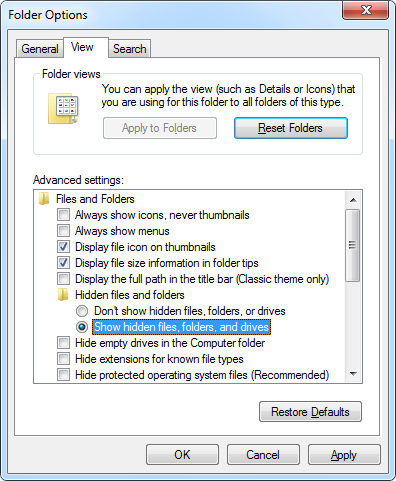 Slicer: if you don’t see the folder, you may need to use Windows Control Panel – Folder Options to enable the display of the hidden and system files. paul breeze: try opening Device Manager, do you see the dvice there? If yes, you may need to format it again. If not, it could be damaged. Try attaching it to a different computer and see if it shows up there. Good luck! For Windows 7 use my batch file. Thanks! Worked great and easy to understand your directions. 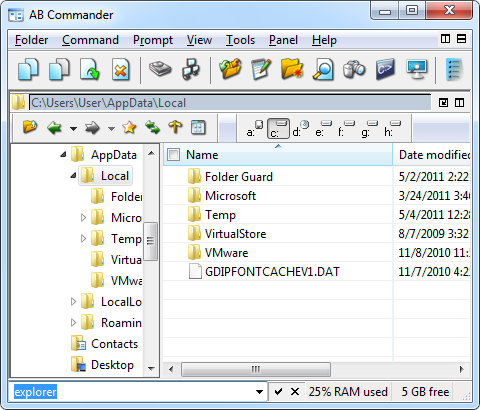 Also, to restart explorer.exe without using AB commander, just type Ctrl + Alt+ delete and start the task manager. You can run explorer.exe from “Run” in the file menu options. Re: How to restore default website icons on desktop. I have been struggling with this problem for the last couple of weeks. I am running Windows XP Professional SP# on a Dell E520 computer, about 10 years old. I followed your steps very carefully, and in fact got to the point where the icons on the desktop disappeared but the incorrect icons did not change back to their website defaults. I have tried many different ways to resolve this issue and felt very confident in yours. Perhaps I did something wrong, but I don’t think so. Do you have any suggestions? What is five minus 4 ?